By Chloe Farand. Originally published at desmogblog. Campaigners have accused the rulebook of being a compromise favouring corporate interests and countries which have been the most obstructive in the negotiation process. Vitumbiko Chinoko, from CARE — an international humanitarian agency — in Southern Africa, accused “a few powerful countries” of holding multilateralism “hostage” during the conference. “Vulnerable countries cannot carry the weight of the world on their shoulders. It is unacceptable for governments to continue to cower behind the inaction of the US and other big polluters,” he said. Patti Lynn, executive director of NGO Corporate Accountability, said the climate talks had ended “without delivering what the world needs”. “Governments fell far short of crafting a just and equitable roadmap to Paris’ implementation. The root cause of this failure — the fossil fuel industry’s interference — was on full display at these negotiations,” she said. For those deeply involved in the process, the fact countries managed to agree on a single set of rules to implement the Paris Agreement — with flexibility in some areas — was a victory for multilateralism diplomacy in the face of growing populist movements rejecting climate action. 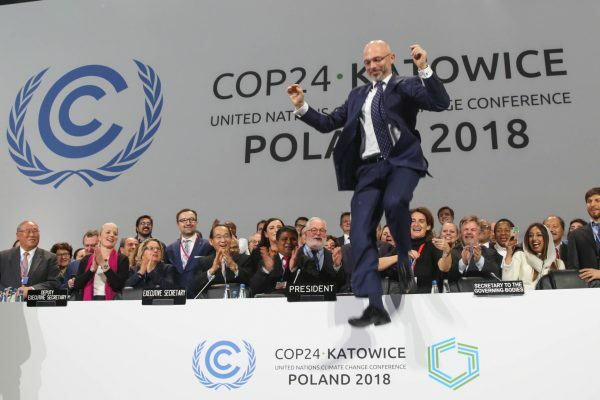 “Despite all the headwinds, the Paris Agreement has stayed course at COP24, demonstrating the kind of resilience it has been designed for,” said Laurence Tubiana, CEO of NGO the European Climate Foundation and one of the architects of the Paris Agreement. The climate negotiations are a unique and very technical diplomatic exercise in which every country around the world have to agree on how to save the planet. As Spanish ecology minister Teresa Ribera told the BBC, this is a “difficult” process. “It is like organising a party for 200 friends, and there’s a single menu that everybody has to eat. It is not so easy but we have got it,” she said. But there is also widespread acknowledgement that the package which was agreed late on Saturday night in Katowice is far from ambitious enough to deliver the level of climate action necessary to prevent climate breakdown. Christiana Figueres, former executive secretary of UN Climate Change (UNFCCC), said the rulebook was “an important step” but that “no one is entirely happy with it”. In many ways, the talks have shown some of the limits of international diplomacy to deliver on climate action in line with the scientific consensus. Urgency was very much the watchword for the talks. In October, leading climate scientists from the UN Intergovernmental Panel on Climate Change (IPCC), warned that the world had 12 years to take “rapid, far-reaching and unprecedented changes in all aspects of society” to limit global temperature rise to 1.5 degrees Celsius and avoid the worst impacts of climate change. To achieve the 1.5 degree target, global emissions need to fall by 45 percent by 2030, according to the report. But the current trend is in the opposite direction. During the first week of the talks, the Global Carbon Project launched a report estimating that global CO2 emissions will rise by 2.7 percent in 2018 — the fastest increase in seven years. One of the biggest setbacks in the negotiations was the joint effort from the US, Saudi Arabia, Russia and Kuwait to block the “welcoming” of the IPCC’s findings, and instead simply “note” the report. The final text “welcomes the timely completion” of the report, rather than the findings themselves. Instead, the rulebook “invites parties [countries] to make use of the information contained in the report”. For campaigners and NGOs pushing for a radical system change, this was a failed opportunity to raise the level of ambition. Mohamed Adow, international climate lead for Christian Aid, said: “This was the first opportunity since the IPCC report for countries to prove to the world that they were taking this seriously. Countries’ current emission reduction pledges are on track to reach three to four degrees of warming — far from the 1.5 degree target. According to a UN report, countries have to raise their current targets fivefold in order to meet the 1.5 degree goal. In the final text agreed at Katowice, countries are not specifically asked to increase their ambitions but simply “invited” to consider enhancing their pledges by 2020. The Paris Agreement will kick in that year, and countries are set to re-submit or update their climate pledges. One of the most technical parts of the rulebook has been left as unfinished business. Rules around “voluntary carbon markets” — known as Article 6 — were delayed because of obstruction from Brazil, which tried to water down efforts to stop “double counting” emissions cuts. DeSmog UK reported that Article 6 is also one of the sections of the Paris Agreement most vulnerable to corporate capture. The CEO of IETA, a business lobby representing big corporations and fossil fuel companies, told DeSmog UK that the group was engaging in the negotiations under Article 6 and hoping to influence its outcome. One of the most memorable part of this year’s talks was the presence of 15-year-old Greta Thunberg, who warned the conference that adults were behaving like children and that it was time for young people’s voices to be heard. “We have come here to let them [world leaders] know that change is coming whether they like it or not,” she said. Adow, from Christian Aid, said that “the most hopeful stories about climate change over the past two weeks have been from outside the walls of the summit,” pointing to school strikes for climate action, grassroots movements mobilising around the world and the rise of Extinction Rebellion. “The global transition is under way and cannot be stopped. The question is will governments help it go fast enough to help the world’s poorest on the front lines of climate change,” he added. Lynn, of Corporate Accountability agreed, adding that more than 250,000 people and 300 organisations from 129 countries signed a “People’s Demands” petition calling on world leaders to put people and the planet before corporate interests. “With the People’s Demands as our guiding light, the movement to demand climate justice has never been more united, organised or determined,” she said. You can read all of DeSmog UK’s coverage of the UN climate talks here. This entry was posted in Doomsday scenarios, Environment, Global warming, Guest Post, Politics, Regulations and regulators on December 18, 2018 by Jerri-Lynn Scofield. Glad to see this reappear. I hesitated to comment earlier, but I’d really like to hear what others think about this – not just this event but the whole narrative. It would be nice to think that humans could make intelligent, long-term decisions that would would benefit mankind in the long term, even if it involved some shared suffering, but that doesn’t seem to be the case. We only seem to be able to pull together once the conflagration is upon us, which while heroic doesn’t always guarantee the desired result. Any substantive addressing and amelioration of human-induced damage to the biosphere will require 7.7 billion to sign on. And sign on to what? Do we humans know what needs to be done? How many holdouts and cheaters will there be, like the Chinese companies that have started manufacturing and spewing chlorofluorocarbons again? Or the people ruling this or that “country” claiming the “right” to develop, and the “right” not to vastly cut back on their extraction and consumption? Look at the basic problem — the human animal wants to live, some interest in seeing his or her family or group prolonged, but mostly interested in stuff that is going to happen in their own lives, while they are alive. The people with power have pretty clearly demonstrated that it’s all about personal pleasure, dance for the moment, and ‘Apres ils le deluge.’ Because, of course, they will be dead, and beyond retribution or suffering. I could be wrong. I hope I am, for my children’s sake. Can’t disagree with any point. No positive spin to add. I think we are just going to ride it out and see where the chips fall. The noise and hand-wringing may get to be excruciating as we dawdle down the road for those who are wake, but what can we do? Two continent-loads of human animals ( the Indian Nations of the Americas) spent several thousand years demonstrating how to do exactly what some Western World people despair of any human animals ever doing or ever being able to do. Here is a book about a groupload of Native Persons who developed a high-density high-yielding carbon-suckdown foodgrowing system without engines or beasts of burden other than themselves. Actually, here is a blogpost about that book, as well as some information about the book itself. Some humans can do this and those humans will. But will it be enough to counter the other humans who won’t? Or to figure out how to destroy the economy and the negative existence of those humans who won’t? And who won’t be recruited to join with those humans who will? So that they have no power over and against those humans who will? My brief thought for COP24. Though we live at the end of the apex of our civilization, perhaps all civilization, let us congratulate our leaders and richly reward the most wealthy for bringing us to this shining moment. As our bright candle burns close to the pan, let the light hold long enough that they might find their comfortable bunkers. For the rest of us — did we ever really matter? I have yet to see a solution to climate change that does not result in the death of a lot of people. The choice we have is either to shut down all emitters, which also means shutting down our food production and transport networks. Or continue onwards in the hope a magical solution will present itself in the eleventh hour. If that fails to appear, we are screwed again. Not to mention that all models seem to indicate that we not only have to stop increasing CO2 but have to remove gigatons from the atmosphere as well. The believe that we have to grow in every possible way certainly does not help either. Very succint summary of our predicament. Sometimes I envy those people who are just able to ignore this and carry on. Manual labor food growing or even Amish-style beast-of-burden food growing is not an emitter unless it actually emits more carbon than the plants driving it absorb. If selectively-mechanised carbon phyto-capture agriculture ends up keeping as much carbon in the soil as all its “moving parts” emit, then it is not a carbon emitter. If it is increasing the carbon bio-storage amounts in the soil from year to year to year, it is better than not-an-emitter. It is a carbon capturing-storager. Can carbon-neutral agriculture/horticulture grow enough food to keep the billions fed? Perhaps if most of the billions were exiled back to the land itself to all grow their separate billions of doses of subsistence food by hand, perhaps it could. Perhaps the billions would rather die. Perhaps that is a choice which will be de facto made. Just as markets can’t solve all our problems, maybe politics can’t either. I’d look at the parts of the article that describe the efforts young people who sense their vulnerability are putting in to make the politics change. There’s a sense I get that “Something’s happenin’here,” on a lot of fronts. One unanswered question is how long it will be before things get really bad. Will there be enough time for popular revulsion to take hold and catalyze some needed change? But what happens if some of the warned of positive feedback loops kick in? Then the transition from “things get really bad” to “even worse” might be baked in. So don’t worry, be happy.. Probably depends on your age bracket. My mother who is 81 is not doomed. She has rose colored glasses and Cadillac health care (unlike her children). She until recently traveled around the world, sees nothing but the same for her children and grandchildren in the future and is generous to a fault. Her children face a different set of problems. I don’t want to think about what her grand children face. Our governments should be very careful when deciding which mechanisms we choose to mitigate climate change. Clearly what is needed is an uprising but future discounting humans don’t seem likely to throw off their chains if they are not feeling the pain right now. Our own mortality might be the inhibiting human characteristic (each of us will die anyway, and the predicted pain is further away than most oligarchs’ death). Another inhibiter is technology, since the oligarch class now has a huge advantage over the working class with surveillance, propaganda, security and weapons to easily put down revolt. In 1789 you just needed some rifles, cannons and a few pissed off army officers, and you could toss the fat cats out. It feels to me like the 0.001% will be literally impossible to dislodge going forward. They are a force of gravity that isn’t going away. Thanks for the link to Matt. Love his work. I’ll try to read it this week so I can get really depressed just before the holidays. My assessment is that the Paris Agreement is grotesquely inadequate. I have never understood why such an incrementalist, feel-good media event keeps getting described as “The Last Hope to Save the Planet”. The Paris Agreement is not remotely good enough. It will not save the planet, even if it gets implemented. This has been the case since the 1990’s, every inadequate agreement heralded as a major step forward. Between the fossil fuel interests (who block any attempt to make the required changes) and the rest of the elites who are dependent upon continued future growth (therefore will only allow for incremental change) there is simply too much for them to lose in the present for the general good in the future. Next step will be geo-engineering with solar radiation management to maintain the status quo. What part of “voluntary, non-binding” sounds…binding? It says more about opponents of the plan who think even acknowledging the existence of the issue is a sin much less doing anything about it. Thankfully reality and facts don’t care about deniers and beliefs. We do not yet really have a Government of Governments. Antonio Guterres needs to define “Ambition”. the Unwilling to buy and use alternative energy sources. I notice that even the utterly spineless PBS networks are starting to actually use the word “climate change” in a few of their broadcasts. And indeed, I get the sense times are changing. After 50 or 60 inches of rain in a single night, people are starting to believe their lying eyes. It also helps that Trump keeps calling it a scam. Fifty inches is no scam, but also, Trump’s tantrum that it’s fake empowers even the Democrat/Hillary side of the MSM to occasionally use the more anodyne forms of the “change” vocabulary in a hopelessly and endlessly vindictive effort to belittle their bête noire. While they will never achieve their ends, the unavoidable side effect in the meantime is more general awareness of global warming. But GW is more baked in at this point than these climate talks describe, encouraging as they are, and for all intents and purposes, it’s arguably baked in more than we contemporary humans seem capable of addressing as a functional operational body to the extent needed and in the ever vanishing time frame we have left..